A brief summary was given on the 05' Yellowstone to Yukon (Y2Y) tax years in the 01’-02’ article, however a few points not mentioned are provided here. The address change to Bozeman from Missoula for Y2Y-MT in the 04' form remains. In the 05' form a total revenue of $675,258 was listed, a drop from the previous year. Y2Y-MT claims on page 21 the governing body mission is to represent "broad public interests". What public interests have been represented by this group? There is no public engagement about the objectives they want to pursue for banning public land use, taking ownership of as much land as possible by various means, nestling themselves into government agencies, using funding to promote themselves and oppose citizens, while chastising and dismissing those who do not agree with them. What representation was offered to those who use the land? None. It is astonishing they passed an audit for this tax year, page 25. The "Y2Y' financial statements by an auditor starts on page 26 with a rehash of their structure on page 32. Page 33 identifies Y2Y-Montana receiving "...88% of its total revenue from two foundations. ", and as of 12/31/05 "...81% of its total receivables are with one foundation." Those are U.S. foundations. What are the goals of these foundation to fund this agenda, what is it that they want? An explanation of how dues are paid is listed on page 22. But there was also some other interesting activity going on at the same time in 05'. Below is a 2005 Yellowstone to Yukon report on Grizzly Bear Conservation in the Yellowstone to Yukon Region by Troy Merrill, one of the original Y2Y board members. This report was commissioned by Y2Y with the "...LTB Institute of Landscape Ecology to conduct the modeling work on grizzly bears...", with Y2Y planning "...to use the information in this report to guide its conservation activities for grizzly bears in western North America." It just so happens that Troy Merrill is also the Research Director of LTB Institute of Landscape Ecology, a business registered in Idaho but with very little information regarding its function. Another undated report on grizzlies was prepared for Alberta, Canada. More truth is given on what Y2Y is doing on conservation, page 17. "We study the habitat needs of wildlife in the Rocky, Purcell, and McKenzie Mountains to determine which core habitats and connecting areas are needed for wildlife populations to survive over time". "We thus make Y2Y science as a tool for making land management decisions...". Y2Y believes they have the authority, and are the only ones with expertise, on how land should be used and governed. That is why they are so aggressive with their objectives. By its own admission, Y2Y states, "Since its inception 20 years ago, Y2Y has used grizzly bears as the main indicator species to develop its conservation strategy." This is a calculated intent and the grizzy is in the crosshairs. All of this money was being dumped into setting up the foundation and agenda with grizzlies being used for eventual banned land use. This grizzly agenda has now been focused down to Alberta, and the Purcell mountains in northern Idaho. Grizzlies are being used as an "umbrella" species, meaning its use captures many other species for conservation. Y2Y deliberately set up these grizzly studies to justify their goal of banning land use. Prohibiting land use is their only agenda. It is clear that over 5 years Y2Y-MT is becoming a very well oiled machine, ready to decide your fate with land use, omitting your involvement by including only those who serve their agenda, while taking government, and your money, to do it. By 06', revenues skyrocketed to $1,258,931, page 2. Transfer of funds to Y2Y-Alberta under contract services is now $1,063,200, divided between program services $787,200, management and general $81,000, and fundraising $195,000, page 3, but shows a discrepancy with 1,053,200 on page 10. What happened to that extra $10,000? It appears they are advancing their agenda in Alberta as much as possible. Why? Page 6 lists Buffler, Bewick, Creegan, and Lapante as retained Canadian board members. New additions are Sean Britt, who previously worked at Earthwatch Institute, and Susan Chatwood, who specializes in promoting partnerships, addressing inequities in climate change, indigenous values, geographical "challenges", and is a university professor. Ament, Baldes, Chester, and Duerr are retained on the U.S. side. On page 14, over 4 years, 02'-05', Y2Y-MT contributions and grants received grew to $3,536,096, with $505,856 going to conservation in just 06', page 4. It looks like the investment in marketing is working. By 07', there is now a P.O. box listed as the Y2Y-MT address in Bozeman, with an increase in total revenues to $2,236,952 on page 2. Is this increased funding coming from foundations, government grants, or private donations? On page 6 is one new Canadian member, Michael Code, who currently works for the Banff Centre, but served as development director on the board. A very interesting addition to the board on page 18 is another Canadian, David Luff, who at the time was the Vice-President of Environment and Operations for the Canadian Association of Petroleum Producers (CAPP) (pg 2). CAPP previously funded two grizzly bear research projects and Mr. Luff was defending how this industry was conscientious of protecting the environment, even writing about it in 2002. Now in 07' he is on the Y2Y board. One new U.S. addition listed on page 18 is Shawn Fitzgibbons, whose background is in the health field but previously worked for Earthwatch. On page 3, under contract services, the funneling of money to Y2Y-Alberta is also more generous, a total of $2,222,397 divided between program services $1,974,897, management and general $42,500, and a whopping $205,000 for fundraising. Although noted the same on previous tax forms, Y2Y-Alberta being a related organization with common officers, it continues to be checked as a "non-exempt" organization, page 7. Is Y2Y-Alberta not a registered "charity" with exempt status? More clarity on Y2Y objectives is given on page 4. They report studies in the Rocky, Purcell, and Mackenzie Mountains were targeted for core habitats needed for wildlife, citing grizzlies and "human needs", and two other species. This science is made available for land management decisions. Program services expenses for this was $1,455,849. Another $576,800 was spent to "communicate" this information to governments and others. Since 05', they were funneling more money into their prize grizzly, using science with subjective predetermined outcomes to select target areas they wanted to ban from use, whether by designated parks or wilderness areas, or controlling restrictions on use. Grizzlies were just the handy patsy for their goal. Payment in Canadian dollars to Buffler, $101,768, Bewick $61,426, Laplante 58,114, Britt $59,137, and Code $64,681 are listed on page 19. Why are U.S. board directors not receiving compensation? From 03'-06' contribution amounts totaled $3,939,065, around $400,000 more than 02'-05', page 14. So there you have it. By 07' this organization was pulling in enough money to conduct biased studies which would support their eventual goal of banning land use between two countries, while using the grizzly as an umbrella species to expand on the amount of land to take for non-use. 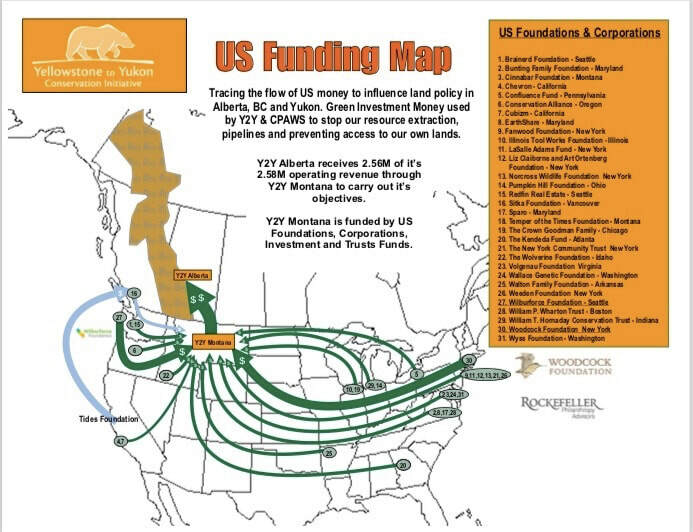 More money was flowing from the U.S. to Canada, with a question as to whether or not Canadian board members were being compensated from that money, and if extra allocations of money were given for grizzly studies. However, what is clear, is that Y2Y was setting up the foundation for exploitation and manipulation of grizzlies for their agenda, a species that would justify their intent to ban land use across two countries. In both Canada and the U.S. the grizzly is declared a threatened species. In 2017 the grizzly was removed from the U.S. list but a federal judge decided it should remain on the list. As a result, the grizzly is now overpopulated, thus the reason for delisting in the U.S.. With more grizzlies there is naturally more contact with us, which Y2Y and other groups can then claim are "conflicts". This serves the agenda for demanding more banned land use and development, and placement of land into "protective" status. Or at its worst, the unnecessary destruction of the animal. Y2Y and all of these groups are willing to go to this extent, manipulation of an animal, to achieve their goal. It has also given them the opportunity to insert themselves into our lives with bear proof trash containers, just part of the subtle ways in which they want to regulate how we live. This bogus crisis was set up clear back in 05' by Y2Y and we are now experiencing the devastating outcomes for us and the grizzly. All of their work, studies, and claims were for this purpose, and they won't give up until they get all of what they want. The 08' and 09' tax reports will be reviewed next. In the previous post, Who Is Y2Y? The Truth, Yellowstone to Yukon (Y2Y) tax forms 01', 02', and 05' were reviewed. Revealed was how the individuals responsible for creating Y2Y set up their structure separately in Alberta, Canada and in Bozeman, Montana. In spite of this split between two countries, Y2Y-MT and Y2Y-Alberta shares board directors, operate "seamlessly", while Alberta staff manages the finances. U.S. dollars that go to Y2Y-Alberta from Y2Y MT includes federal grant money and donations from U.S. citizens. It is an Internal Revenue Service (IRS) requirement that all 501(c)3 organizations "...must make available for public inspection and copying its annual return." The public has a right to know Y2Y's financial and administrative structure. Not mentioned in the previous article were the Directors of this new organization, listed on the 01' tax form. Directors from the U.S. included Katherine Deuel, at the time a recent graduate from Montana State University, Caitlin Fox, and Marguerite Mahr, a Switzer Fellow. One Canadian Director was listed, Jim Pissot, Executive Director for WildCanada Conservation Alliance, and previous Executive Director with Defenders of Wildlife Canada. Deuel and Mahr were listed again on the first 02' tax form. However, another important aspect on page 27 of the 01' tax form, filed in the U.S., was Pissot signing that the new initiative would be allowed exemption for lobbying activities, a 501(h). Called the Election/Revocation of Election by an Eligible Section 501(c)(3) Organization to make Expenditures to Influence Legislation, Pissot signed electing Y2Y -MT to influence legislation, which carries some financial restrictions for eligibility. This is used to skirt a 501(c)3 general lobbying prohibition. Fascinating, a Canadian signing a U.S. tax form allowing an exemption to influence U.S. legislation. As Y2Y progressed through the years, what other surprises are there? Looking at the 03' tax form below, new Officers, Directors, and Trustees are listed on page 5. From Canada are Robert Buffler, an environmental consultant, Executive Director; Jane Bewick, Business Director; Brian Churchill, Secretary; Wendy Francis, Chairperson and conservationist,; and Jeremy Guth, Director. On the U.S. side are Rob Ament, Director; Barb Cestero, Director; Bob Ekey, Director; and David Hadden, Director. Page 16 lists new replacements from Canada, Beth Russell-Towe who is involved with tourism promotion, Jeremy Guth, a Woodcock Foundation Trustee while still working with Y2Y, and Peter Wesley. Peart, a carry over from 02', has worked for Parks Canada, Sierra Club BC, the Canadian Wildlife Service, the BC Ministry of Aboriginal Affairs, the BC Outdoor Recreation Council, the Royal BC Museum, and the Canadian Parks and Wilderness Society-BC Chapter (CPAWS). As for the players in the U.S., Ament would be a U.S. equivalent to Harvey Locke in Canada, having been involved not only with Y2Y, but with the Center For Large Landscape Conservation, IUCN, Wildlands Network, and Western Transportation Institute. Cestero works for the Wilderness Society and previously worked for the Greater Yellowstone Coalition, Ekey has also been involved in the Greater Yellowstone Coalition, Wilburforce, and Wilderness Society, while Hadden has been involved in the Montana Wilderness Association and is currently the Director of Headwaters Montana. Johns is co-founder of the Wildlands Network. One new replacement in the U.S., from Idaho, is Levi Holt, Nez Perce Tribal member and National Wildlife Federation board member. These are some of the technocrats who are deciding how you can use the land, devising plans to design it into something they think it should be, while using wildlife and climate change as justification. But there are so many others who are involved. There is also a new address listed on the first page, changing from a physical address in Missoula to a post office box. Page 2 lists an increase in revenue to $1,046,906. Contract services expenditures on page 3 lists $305,315, with $280,315 for management and general, and $25,000 for fundraising. This is the payment to Y2Y-Alberta. On page 9, Part III, (e), the box is checked NO, that there was no transfer of any part of its income or assets. Was money not transferred to Canada? Perhaps that is not the correct interpretation for this item. In fact, the tax form, even though it is a U.S. tax form, is signed by Canadian Jane Bewick on page 7. These are just some basics of the 03' tax return. There are some interesting tidbits in the 04' tax forms. Starting with the mundane, instead of a post office box listed, there is now a physical address for Y2Y-MT in Bozeman rather than Missoula. The total revenue dropped from the previous year to $836,924 on page 2. Previously, a question lingered as to why a second tax form was filed in 02'. "Revised" is written with an 04' date on the board member list and on the last page of the second 02' tax form in the previous article. An interesting shift occurred with the money being funneled to Y2Y-Alberta on page 3, still noted as contract services. On this return it jumped to $614,400. Now there is also a list of how the money was split between program services for $493,400, management and general for $86,000, and fundraising $35,000. It appears Y2Y-MT is funding the Canadian agenda more. Perhaps from the money flowing to Y2Y-MT from the government, donations, and foundations it was decided Y2Y-Alberta deserved their share of money. Either that or perhaps the decision was made that conservation should be more targeted in the Alberta area. Still checked marked Yes is the section on being related to the Yellowstone to Yukon Conservation Initiative Society, or Y2Y-Alberta on page 6, and the books are still managed by Alberta. Page 10 shows a total revenue from grants and contributions for the years 00' to 03', a massive $2,364,990. Over two million dollars to create schemes which remove our right to use our land. There was a minor shift in Directors. Canada continued with Buffler, Bewick, Francis, Guth, Peart, Russell-Towe, Sawchuck, and Zummerman with a new Canadian addition of Christine Torgrimson, pages 5 and 16. Torgrimson is Executive Director of the Salt Spring Conservancy, an uncanny way for Americans to get a tax deduction and not be subject to Canadian capital gains tax. That's pretty interesting. Is there no end to this conniving? As for the U.S., Ament, Ekey, Hadden, Holt, Johns, LaBelle, and Skeele remain. Gary Tabor returned, and another new director is Richard Baldes, a Tribal Water Board official, former U.S. Fish and Wildlife Service employee, board member of the National Wildlife Federation, Y2Y, and Greater Yellowstone Coalition. These are changes noted in the two tax forms, but each year up to 16' there are other changes as this group expands. Understanding who the players are is an important aspect of Y2Y in addition to the financial issue. The IRS "...reviews the board composition of charities to determine whether the board represents a broad public interest..." which clearly is not the case in the Y2Y board. So, from 03' to 04' Y2Y continued to grow, financially, and through influence in their Board of Directors. They further enmeshed themselves with other conservation groups, a foundation, former federal employees, Tribes, and a land trust organization. Blatantly absent is any representation from regular citizens in communities. No citizen, who holds representation from their local government, is included in this amassed group of people, they are deliberately left out. That is purposeful on the part of Y2Y, they exclude all those who don't hold the same ideology, or perceived status, and share no concern about citizen rights or jurisdictional boundaries. This is what Y2Y is about. More to come with the 06' and 07' tax forms, and quick refresher on 05'. The Y2Y website states it is a registered charity in Canada, and is registered as a 501(c)3 through its "Montana Society" in the U.S.. Y2Y officially registered their organization as a Canadian charity and as a 501(c)3 in the U.S. in 2005. But the hatched plot for Y2Y goes a little deeper. From 1997 to 2000, the players worked on organizing their vision. By 2000, Y2Y, in Montana, then requested a non-profit status. Because there had been no actual activity up to this point, Y2Y was issued a "Ruling Letter" on 9/1/2000. Ruling dates involve a letter written in advance of operations if the "...organization can describe its proposed operations in enough detail to permit a conclusion that it will clearly meet the particular requirements of the section under which it is claiming exemption." This gave Y2Y in the U.S. the ability to accept donations and build their environmental empire. At the same time, Y2Y was kept as two separate entities, one in Canada and one in the U.S., even though they co-existed as one organization. The 2001 Y2Y-MT tax form below provides some interesting information about the beginning of Y2Y. The address is listed as Bozeman, Montana with a revenue of $674,777.00 for the year. On page 3, there is a notation of expenditures for contract services in the amount of $127,760.00. Page 5 indicates the Executive Director is located in Alberta, Canada with remaining associates in Montana. Already this "U.S." non-profit was setting themselves up as an organization that was started in a foreign country but split between two countries, but arranged to operate as one group. Page 6, 80(a)(b) states, "Is the organization related through common membership, officers, trustees...to any other exempt or nonexempt organization?" This box is checked Yes and lists "Yellowstone to Yukon Conservation Initiative Society." This is the Canadian version of Y2Y located in Alberta. In fact, at the bottom of page 6, a Canadian is responsible for managing the finances. On page 13 there are specific questions about transfers of cash "from the reporting organization to a noncharitable exempt organization". All boxes are checked No. "On February 25, 2001 Yellowstone to Yukon Conservation Initiative (Y2Y-Montana) entered into an Agency Agreement with Yellowstone to Yukon Conservation Initiative Society (Y2Y-Alberta), a non-profit Society incorporated in Alberta, Canada Y2Y-Montana receives funds given in the United States to be used in Y2Y programs. Y2Y-Montana maintains full and complete direction, control and supervision over the application of the funds it receives Y2Y-Montana contracts with Y2Y-Alberta for services rendered for the purpose of carrying out its charitable activities"
So this organization was set up specifically in the U.S., presumably by Montana individuals who were involved from the beginning, in order to funnel money to their organization in Canada via contract. They aren't giving to a charity, they are giving to themselves. The actual agreement begins on page 22. Over the years Y2Y-MT has funneled millions of dollars to Canada for purposes of implementing Y2Y objectives. There is no separate charity. In 2002, Y2Y-MT listed their address in Missoula, MT with a total revenue of $671,747.00 for 2002. On page 3, $263,279.00 was an expenditure for contract services, the money given to Y2Y-Alberta, broken down by management and fundraising. Page 5 indicates two U.S. citizens were compensated for their work, and the interim Executive Director and Finance & Operations coordinator were Canadians. Again, 80(a)(b) are checked Yes, listing Y2Y Society as the related agency. Canada is listed as being "in care of the books" on the bottom of page 6. For unknown reasons a second tax form was filed in 2002, however this tax form lists the new Board of Directors on page 11. The Canadians include Mac Hislop, Stephen Legault, Harvey Locke, Bob Peart, Wayne Sawchuk, and Ellen Zimmerman. On the U.S. side are Ernie LaBell (Jackson), Troy Merrill (ID), Ray Rasker (MT), Tom Skeele (MT), and Gary Tabor (MT). So we have allegedly two separate entities, in two separate countries sharing directorship through a contract. What other organization gets this cozy with a contract agency? The truth is they don't. "The programs were started in 1995 by a network of U.S. and Canadian organizations, scientists and individuals. In 2000, the program became two separate entities, Yellowstone to Yukon conservation Initiative (a non-profit corporation incorporated pursuant to the laws of Montana, Y2Y Montana) and Yellowstone to Yukon Conservation Initative Society (a non-profit Society incorporated pursuant to the laws of Alberta, Canada, Y2Y Alberta.) It is the intention of Y2Y Montana and Y2Y Alberta that the two entities operate seamlessly, with one set of programs and activities addressing the region as a whole. Y2Y Alberta and Y2Y Montana have identical membership on their respective Board of Directors." "Y2Y Montana contracts with Y2Y Alberta for services rendered for the purpose of carrying out its charitable activities. Both of these organizations have the same Board of Directors and the same Executive Director, but Y2Y Montana is an American nonprofit corporation and Y2Y Alberta is a Canadian entity. Because generally accepted accounting principles differ between these two countries, the corporations have not been consolidated." "For the year ended December 31, 2005, Y2Y Montana paid Y2Y Alberta contract services in the amount of $911,000." Y2Y- Alberta tax forms have also been studied but all information from both groups is too exhaustive for this post. The focus of this post was explaining the true origins of Y2Y, how they operate with Canada, and expose the vast amount of U.S. money being sent to another country. Indeed, Canadians have significant issues with this funding mechanism, and are suffering the same type of attacks with losing access to land because of the agendas Y2Y pursues, which are the same in Idaho. Because they are "seamless", they are really the same group, with the same individuals, and with the same agendas. Over the years the Board of Directors has changed but it is always a combination of Canadians and Americans. In the 2005 tax form, on page 20, it states, "Yellowstone to Yukon Conservation Initiative Society is a nonprofit corporation formed under the laws of Alberta, Canada. It has not applied for federal tax exemption in the U.S." Is this legal given the amount of money being funneled across the border? It is known conservation initiatives and environmental non-governmental organizations (NGO) reap in large sums of money as non-profits for their agendas. Much of this money comes from John Q taxpayer through grants from the federal government, wealthy foundations, and private donations. Tax filings explain what happens with this money. The Greater Yellowstone Coalition (GYC) seems to be one of the more well funded organizations and is registered as a 501(c)3 in Montana. Interestingly, GYC is registered as a "foreign" non-profit corporation in Idaho (type Greater Yellowstone Coalition in the search box), most likely because it is registered in Montana, initially filing in 1985. 501(c)3 organizations are often called charities, or non-profits, can receive tax deductible contributions, and are tax exempt. There are certain requirements a 501(c)3 must follow including restrictions on lobbying, political activities, and political campaign intervention. Lobbying is defined as "influencing" legislation. However, a 501(c)3 can engage in public advocacy not related to legislation or a election of candidates. Front groups that are created by these large organizations do the lobbying for them. In the PDF below there is information on GYC lobbying expenditures from 2016. On page 8, Forbes-Tate Partners in Washington, DC was paid $116,300 to do the lobbying for GYC. It is unclear from this document what lobbying activities were pursued by GYC via this organization. On page 25, GYC reports spending $18,778 for lobbying to influence public opinion (grass roots lobbying). Another $118,957 was spent to "influence a legislative body (direct lobbying)". There is also a chart of a 4 year averaging period, over 1 million was spent on lobbying. GYC justifies some of their activities as a charity organization beginning on page 48-49. Their listed objectives include protecting core habitat...facilitating connectivity between Yellowstone Bears...new programs for voluntary grazing allotment retirements, construction of highway wildlife crossing structures...and expanding our work on protecting wildlife migratory corridors across greater Yellowstone. It goes on to state GYC's lands program is focused on securing new protections...for this landscape...permanently protecting...building solid momentum behind a partnership that is seeking to protect critical wildlife habitat on private lands in the Henry's Fork watershed, and advocating for new administrative protections on the BLM lands. Lofty goals, but with their lobbying efforts in D.C. perhaps they will succeed. They are also using their money to buy "voluntary grazing allotment retirements", one reason ranchers are having such a difficult time feeding their herds, GYC buys up this land and locks it up forever. Another GYC tax form that contains interesting information is from 2014, in the PDF below. Page 44 explains their "Program Service Accomplishments" and includes working "...closely with our national partners to ensure important conservation measures are not undermined, protecting public lands..in the High Divide in Wyoming, "...celebrate a significant win as we finalize the Shoshone National Forests new forest plan, which will put almost one million acres off limits to oil & gas development", and at least acknowledges their intent to "ensure key forest lands are protected rom expanded motorized use as the Shoshone launches a travel planning process in Eastern Idaho". They finalized the Shoshone plan? Why not, on page 33 it shows GYC gave the US Forest Service $125,000 for bear bins. Guess the forest service owes them a favor. In 2015, GYC gave another $137,000 to the US Forest Service for bear proof containers, page 34. On page 36, GYC gave Wyoming Wild Sheep $100,000 for a grazing allotment buyout, another conservation group. This is what GYC is doing with your tax dollar from the federal government. Read through these documents, look at the numbers. It is no wonder local citizens have to scream so loudly to have their voice heard when these type of groups are buying favors from the government and taking land away from you. Yellowstone to Yukon (Y2Y), having been exposed for their connectivity agenda, has changed their tactics of late. One is changing their messaging on promoting overpasses by now saying they are for "safe wildlife passages" in an effort to convince Fremont County citizens to vote Yes on the upcoming Advisory Vote. A Yes vote essentially gives the green light to supporting wildlife overpasses and miles of fencing (See Fremont County Citizens article under IP Focus tab). 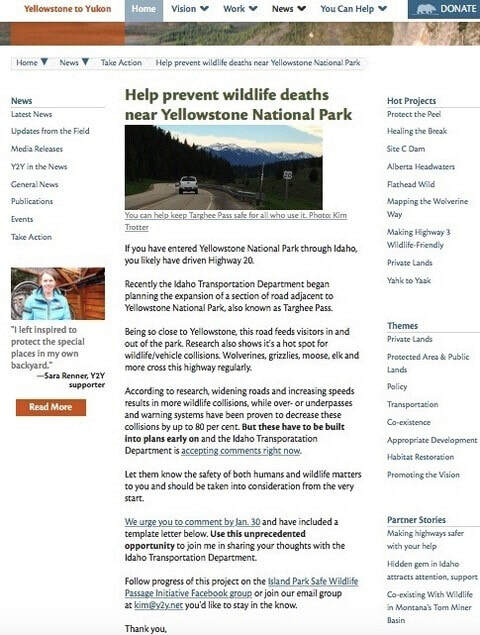 Now they are hitting old statistics as a means to justify "safe wildlife passages", which is really their same agenda for overpasses, tugging more on the fear factor of safety rather than the poor Elk being roadkill. Justification for wildlife overpasses by Y2Y has always been about Elk, now they are shifting their focus to Deer? Why? Do Elk collision numbers not justify their cause? Of course they don't, and never have. Below is a screenshot of a 2016 map used on the Island Park Safe Wildlife Passage (IPSWP) facebook page from 2017. Once again, this map is misleading and the reason Y2Y is using it, because it is misleading. 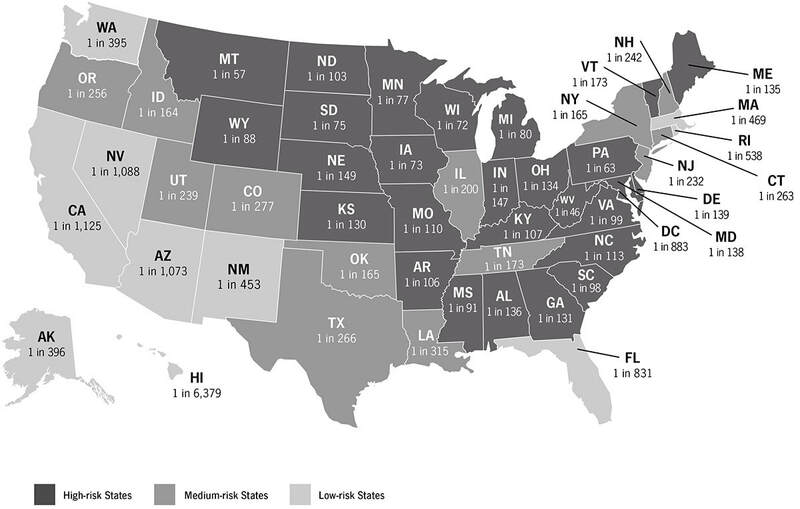 This map, and Y2Y, report the likelihood of drivers hitting a "Deer" in Idaho is 1 in 147. That is in 2016. 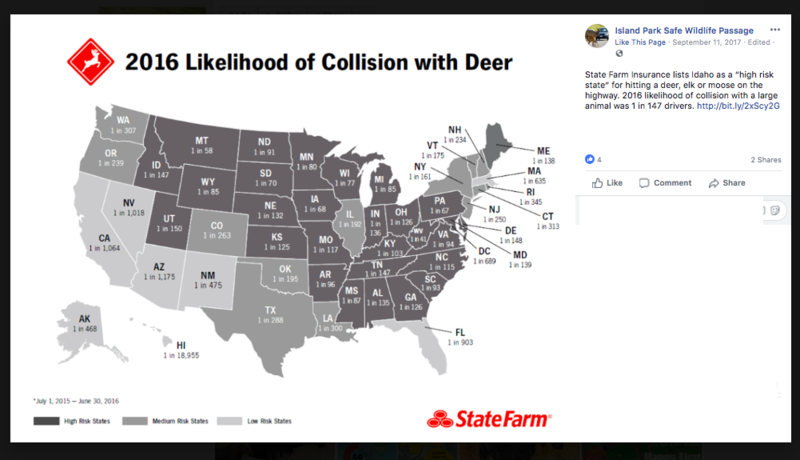 However, the truth is, in 2018 State Farm reported fewer Deer collisions. and the factual number is 1 in 164 for Idaho. Idaho is not in the top ranking for collisions and never has been, even in 2016, or 2015, or by the CarInsurance website. Montana continues to rank at the top, perhaps Y2Y should leave Idaho and focus on Montana for their overpass agenda. Here is the accurate, factual, State Farm map. It is unlikely this will be posted by Y2Y as an update to the previous map. Perhaps the rush was getting the old map up as the new State Farm numbers were soon to be published, numbers that don't contribute to the Y2Y agenda, but rather lessen the support for it. Y2Y, stop using inaccurate and misleading data. One has to assume that Y2Y U.S. 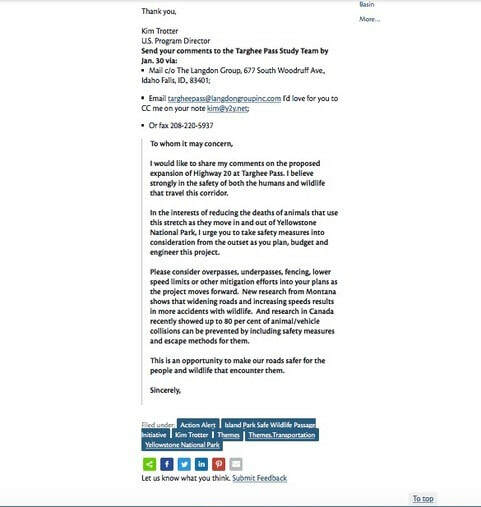 Program Director, Kim Trotter, creator of IPSWP, is the one who is trying to manipulate a false picture regarding the overpass agenda by using outdated Deer data. This just continues adding to Y2Y's lack of credibility along with their other manipulated data on roadkill. The shift from Elk to Deer is incredulous and might suggest there is some desperation in the Y2Y campaign for manipulating their propaganda. Won't work. Island Park, Fremont County, and Idaho citizens are smarter than you understand. Further research on the Targhee Pass Environmental Assessment (EA) report has revealed a very interesting piece of information. In Section B, comments from 29-55, a total of 27, are all the same, copies of each other. It seems this was generated at the request of Kim Trotter with Yellowstone 2 Yukon (Y2Y), even requesting a copy of submissions be sent to her. There is no date when this was posted, however it was prior to January 30 as she requested comments be submitted to the Idaho Transportation Department (ITD) prior to that date. What is she tracking? Here is the link to the Y2Y website with the request. The sample comment listed on the Y2Y website are the same as those 27 comments in the EA scoping report. In case Y2Y decides to remove the web page, here is copy of it that confirms those comments came from Y2Y. This is why ITD only considers them as 1 comment, it came from one source, in this case Y2Y. There were occasional variations of the lead sentence, however ITD did count comments that contained this duplicated form terminology as ‘unique’ and proponents are now using those added comment totals toward their positive comment tallies. It is unfortunate Y2Y incorporated their biased work into a comment form for ITD. Idahoans should have all information regarding overpasses in order for them to make an informed decision. In studying the scoping report, I have found in each comment period a lengthy guidance/suggestion comment submitted jointly by The Yellowstone to Yukon Initiative and the Greater Yellowstone Coalition. At this time, I will not address the majority content, it is very comprehensive. I would like, however, to address a single sentence found in the first comment they submitted. Weskamp, David, (The Nature Conservancy), Laatsch, Jamie, (Henry’s Fork Foundation), Rinaldi, Kathy, (Greater Yellowstone Coalition), Trotter, Kim, (Yellowstone to Yukon Conservation Initiative), VanFleet, Mary and Parmer (various affiliations), Seidler, Renee, (Wildlife Conservation Society), and Reynolds Ph.D., Timothy (wildlife biologist). Letter to Idaho Transportation Department, Attn. Adam Rush, Comments on Idaho Transportation Department 2017-2021 Idaho Transportation Investment Program. 29 July, 2016. This is 6 months before ITD ever came to Island Park to talk about a project on US 20, and it would not be until the end of July 2017 that ITD would tell Fremont County and IP that wildlife overpasses were included in the alternatives. The advocates promoting wildlife overpass alternatives at Targhee Pass are represented in citation #11. From that July 2016 date, you can conclude that these ‘special interests’ had an entire year to seek other agency and non-governmental organizations support for the overpasses. Since they had partnered with ITD in HWY 20 analysis, they also were aware of the ITIP planning effort and potential HWY 20 projects. They were all collaborating far in advance. The community of Island Park and Fremont County did not. We have not been involved, informed or coordinated with in this process. Island Park and Fremont County should request and be given a copy of that letter. This midyear, 2017 Center for Large Landscape Conservation (CLLC) newsletter exposes the truth about the intent of conservation initiatives to use transportation projects for overpasses for their connectivity goals. serve to link protected areas...", coming straight out of the IUCN. (TWG) "to develop global policy that addresses transportation infrastructure and development with regard to roads and rails within the ACCs." This effort will develop a coalition of individuals and NGOs by building resources to help them "...develop expertise in mitigating roads and rails for wildlife and connectivity." This means they are building their army, with the intent to force us into surrendering to their notion of conservation, using Tribes as part of their efforts. as critical linkage areas." Their influence over our government has also "...been driving policy creation and helping craft new legislative language at the federal, regional and state levels, as well as participate in a limited number of local, on-the-ground efforts. This includes activities such as commenting on and shaping federal land management plans- which ...included...National Forests. We are also focusing on state wildlife plans and state-based wildlife corridor legislation, county plans...", and "...influence federal administrative policies, state-based initiatives and provide wildlife corridor information for legislation across the country." They openly admit to manipulating our government for their objectives. wildlife crossing structures...", specifically focusing on Hwy 20 at Targhee Pass. If they have been focusing on Targhee Pass, where has their name been disclosed? Does this mean all of their work has been in secret? Are they laundering their intentions behind other groups such as Yellowstone 2 Yukon, Henry's Fork Legacy Project, and perhaps even the Master Naturalists? Who are the front groups for the CLLC? Bottom line, this newsletter openly exposes everything that has been published about these groups. The have full intention to use transportation projects for their corridor and connectivity objectives. If they are not stopped now, they will only advance those objectives until Island Park is taken over by them, placed into some form of conservation per their desire, and eventually controlling how Island Park is used. Do Not let that happen. Sign the petition and join others in stopping all efforts to put wildlife overpasses in Island Park and ending their conservation objectives. This is the Highway 20, Targhee Pass Project Scoping Report, first joint comment submission noting Citation #12 by Yellowstone to Yukon and The Greater Yellowstone Coalition. For a researcher, rarely do you find a definitive document that is full of multiple validations. Usually it takes months of dogged discovery of bits and pieces of information that you find in multiple sources, and it requires the researcher to pull it all together in one place. The Center for Large Landscape Conservation did that for us in the 2017 Newsletter and past articles Ken Watts has written for this paper have broke down that document. Further validation of the Center for Large Landscape Conservation’s role in the Targhee Pass Project can be found in the scoping report. Last week, I reported about citation #11, found in the first joint comment submitted by The Yellowstone to Yukon Initiative and the Greater Yellowstone Coalition. This week I will follow with citation #12 of the same comment submission. The subject of both citations are about two letters, submitted to ITD concerning future funding and projects coming available. These letters speak to intimate knowledge about the upcoming project at Targhee Pass in the first place, and how wildlife passages were introduced into what was originally a scheduled highway upgrade on a segment whose life-cycle requires it. Callahan, Renee (Center for Large Landscape Conservation), Domenech, Elizabeth (Yellowstone to Yukon Conservation Initiative), McClure, Meredith, (Center for Large Landscape Conservation), Paul, Kylie (Defenders of Wildlife), Robinson, Lacy (Yellowstone to Yukon Initiative), Trotter, Kim (Yellowstone to Yukon Initiative). Letter to Idaho Transportation Department, Attn: Adam Rush, Comments on Idaho Transportation Department 2017-2021 Idaho. When ITD credited this community for the requests that they had received asking for wildlife overpasses to be introduced into this project, they were in fact misleading this community. Those requests did not come from us, they came from the largest and most influential conservation/environmentalist NGOs operating in our 5-western state region. I have spent the last week doing a forensic analysis of the ITD Targhee Pass Project scoping report public comments. This forensic attempts to determine true/unique submissions and gauge impact population support or opposition to wildlife overpass alternatives. The document is 217 pages, claims 496 total comments. At least 243 were a form letter or ‘canned pre-prepared’ comments. ITD has expressed that such comments would only count as 1, therefore, in three comment periods those comments should only count as 3. I have not considered the non-governmental organizations or agency comments in this analysis. It is very critical to know that NO COMMENTS are DATED, therefore it cannot be determined if the comments were provided during the legal comment periods. It is also critical to know that the scoping document did not reveal any names or addresses. Public agencies are required to inform people providing comments that their names and address may be released to the public, they should be, it is the only verifiable control in the process. Island Park and Fremont County also need to know that ITD’s conservation partners on this project were given a project number to submit comments to at least 6 months before they ever came to Island Park to talk about the HWY 20 Targhee Pass Project. The Island Park Safe Wildlife Passage initiative has been running an active campaign since at least July 2016, and those same wildlife advocacy partners came with ITD to that first December blizzard ‘workshop'. At that sparsely attended event, wildlife overpasses were not offered as alternatives being considered. During the first comment period, which the report verifies lasted 6 months, December 15, 2016 to July 27, 2017, ITD had not yet publicly revealed that wildlife overpasses were being considered in the alternatives. The public was also instructed that the comment period ended January 30, 2017. Some people had guessed about the wildlife overpasses. Many asked repeatedly for this to be confirmed or denied, and were told that we had to wait until an alternatives ‘workshop’ could be held. that would not happen until the end of July 2017. Positives during this comment period should be suspect, the public did not know. How can the public trust that the positive 61 comments received during this time are valid, or know if the comments come from local , in-state, or out of state residents. The public was informed of a 45 day comment window, the study team accepted comment for at least 6 months after that. This comment segment is improper on many levels. The last two comment periods, 60 days, there are 18 more positives than negatives. *an 18 comment advantage does not illustrate over-whelming local, county and true impact population and stakeholder support for wildlife overpasses.